Two is always better than one, especially when it comes to Thai Nakorn. 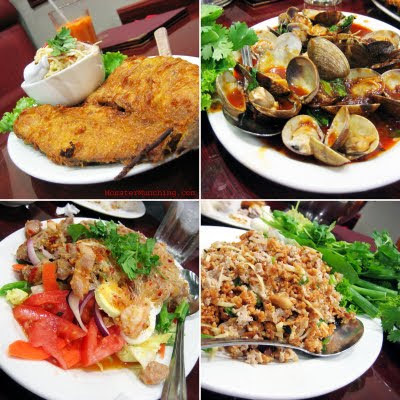 The venerable restaurant, considered by many (including myself), as the best Thai in O.C., has multiplied. As everyone knows, there's one in Stanton, which opened because this Garden Grove store burned to the ground a few years ago. Now, the Garden Grove sibling has risen up again, and yes, quite literally, from the ashes like the proverbial phoenix. But look! This bird's grown out new plumage! 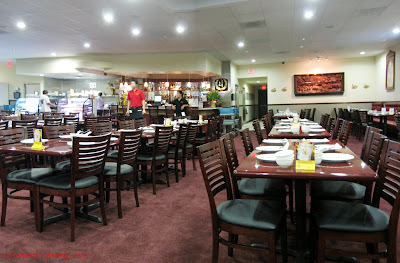 The place got a facelift, the only kind I can't mock, because the restaurant does look a lot younger than before. This, ladies and gents, is the most stylish Thai Nakorn ever. Not that disliked the way the old building looked, with its A-frame Googie charms, but this, to put simply, is up with the times and an elegance that befits the food. Even without all the new recessed lighting, this dining room would shine, with tables so sleek it gleams like mirrors. There are private banquet rooms, the requisite photo of the king, and enough elbow room for everyone to pass around plates of their fantastic dishes. If you are new to the place, allow me to offer a tip: Come here with lots of people. The more mouths you bring, the more you can order, the more you can sample. Trust me, you'll want a taste of everything. Another tip: the parking lot is still as tiny as ever, with a capacity to accommodate about ten cars at the most. We were lucky. We arrived early at quarter to seven, before the dinner rush was in full swing, so we easily secured a spot. Those who came in the thick of it all had to resort to inventing their own parking spaces. Also, if you're new, go ahead and get the pad thai, the satay, the tom yum. They'll be the best version you'll have anywhere. But when you're ready, mix in some dishes from the Issan specialties. 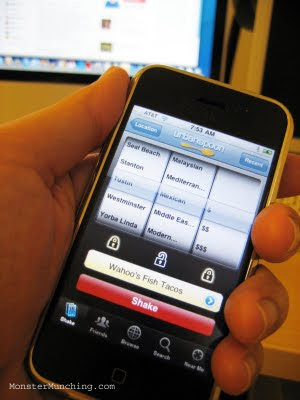 This is the list on the first page of the menu; the one crammed in single space with no prices. Among other things you'll see here: The stir fried morning glory, one of the most vibrant, refreshing plates of stir-fried greens you'll ever crunch. 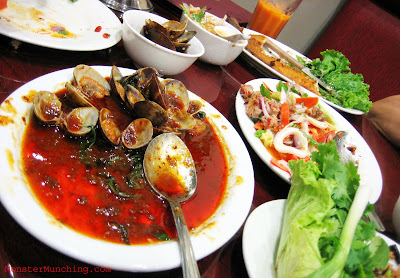 You'll also encounter the clams, a dish that takes you deep into the jungle, into the hearty darkness and glorious stench of fermented shrimp paste. It clings to the clam shells, gathers on the plate like mud on a river bank, and sticks in your memory as one of the funkiest substances you've ever put in your mouth. It's delicious. Another specialty is more accessible to all palates: The whole, deep-fried deboned trout. You eat it all. The skin crackles like dry parchment. The moist meat flakes. The golden casing of batter smacks of turmeric. On top of each morsel you pile shredded mango salad that comes in a side bowl. A warning: The stuff is riddled with finely diced Thai chilies you might not see at first, but will melt your face into dribbling mess of flop sweat and tears. Approach with extreme caution. If it's already too late, cool off with a salad, which you should've already ordered. But don't think it'll provide much of a reprieve. The yum yai salad will do its best though, since it's probably the sweetest thing on the menu aside from dessert. Also, it is a salad the way a cobb salad is a salad. There's hard boiled egg in it, which works really well to soak up the sweet and sour sauce that coats everything else in the dish -- a roster that includes celery, tomato, cucumber, chicken, and the clear Jell-O jiggle of glass noodles. The nam sod is also a good palate cleanser. With the dish, I'd suggest the plain nam sod over the one with crispy rice. In the latter, the nutty crunchiness of the Rice Krispy-like grains are pleasant at first but distracting when all you want to do is focus your attention in how the ginger slivers and lime juice join forces to make ground pork as light as a prance. Lettuce leaves, cilantro, ram-rod straight green onion stalks, and lemony leaves that make you pucker, are always served on the side to refresh -- as if you need it. 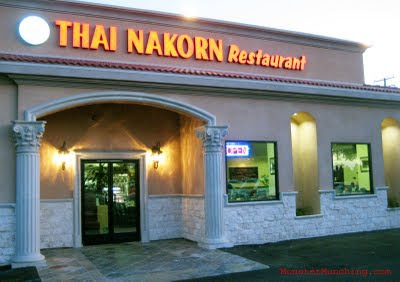 By the end of the night you'll groan, rub your stomach satisfied, and swear you'll never gorge yourself like that again...at least not until you come back to one of the two Thai Nakorns in O.C. Pizza & Chicken Love Letter, the Korean fried chicken and pizza chain (yes, there is such a thing as Korean pizza) has one of the awesomest restaurant names in the whole of Orange County, if not, the world. And now, Irvine has one. It is, of course, located in the most Asian-y (that's not a word, I know) complexes in Irvine, Diamond Jamboree. But before you shout "YOU LIE! ", I can assure you I speak the truth. Nevertheless, I can understand your disbelief. Even if you've staked out the plaza from the parking lot, walked it foot-by-foot, or stood in the forever-line at 85°C Bakery Café, you couldn't have seen this place coming. It's not even hidden in plain sight. It is just hidden. Hidden inside the H-Mart supermarket, which itself is laid out in a confusing labyrinthine maze worthy of Ikea. Pizza & Chicken Love Letter is at the very end of the store, next to the restrooms, at an unremarkable booth, existing as almost an afterthought. Here's how unassuming it was: I was sitting right in front of it and I didn't realize what I was looking at while I perused the menu marquee. "Hmm...that's interesting, this place serves Korean pizza and fried chicken like that Love Letter place I've head about in Garden Gro...heeeeyyy, waaaaait a minuuuuuuuttttte!!!!!" The realization, of course, was followed with a scramble to order something. 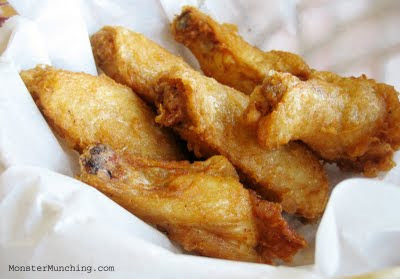 I took the easiest, most accessible item: the 6-piece fried wings for $4.99. With it came unexpected and complimentary sides that included a plate of shredded cabbage, which became a coleslaw the second they drizzled on thousand island, and a salad when they added corn kernels. But the complimentary extras didn't end there. Pickled radish -- the customary accompaniment to Korean fried chicken -- came brimming in a generous bowl. Kyochon in Stanton, it must be noted, charges a buck per serving. 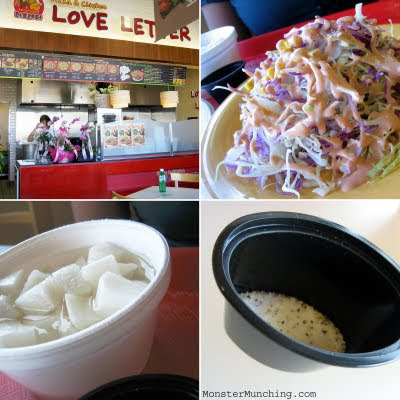 Love Letter's, however, bit more sharply and were less soothingly sweet than Kyochon's. While I'm making comparisons to Kyochon, I'll talk about the wings I chose. They were the base model, without the upgrades that could've gotten them glazed in a spicy sauce or honey, which I believe are standard at Kyochon. Regardless, it was well-cooked, gilded with just a barely-there covering of batter, which allowed the subcutaneous fat to melt off, transforming floppy skin to a thin crispness: the most coveted part of all Korean fried chickens. The meat beneath, however, was surprisingly flavorless, which was probably why they included a cute oval thimble of peppered salt for dipping. Forget about trying to fit the wings in them though. To say that they were humongous is still understating it. Judging by the wingspan of the things, these mutant hens could've gone against a condor in a welterweight match-up. Either that or someone had finally had enough of Foghorn Leghorn's snark. But wait, how's the pizza, you ask? I don't know. This post wasn't so much a review as it was a "preview". I tried only one dish, after all. So I am not yet ready to grab the mike and proclaim that Pizza & Chicken Love Letter has the best music video of all time....I mean, pizza. It does, however, still has the best name. The subtitle of this post is "My lunch with Gustavo Arellano", because the story is also about who I was with, as it is about what I ate. To me, eating at this taco truck in the heart of Santa Ana with Gustavo was like teeing up with Woods; jamming with The Edge; or, to put it in terms a foodie would appreciate, eating with Bourdain in New York. We were in his element. Gustavo Arellano -- the man, the myth, "The Mexican" -- is the sage of all things O.C. food, especially about SanTana's loncheras. He wrote the definitive story on the subject, a behind-the-scenes tale of everything you ever wanted to know about OC's taco trucks but were afraid to ask. And this was Alebrije’s Grill, the lonchera at the heart of the article, which coincidentally, Gustavo proclaimed, was one of his favorites. "The thing to get here is the tacos acorazados" he said as soon as I met him on the street. A common mistake people make, he tells me, is not going beyond the usual and forgoing the specialities of the house...er, vehicle. 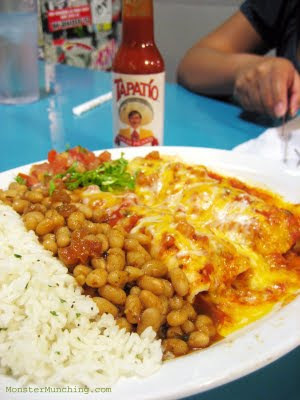 With only a rudimentary knowledge of Mexican cuisine that doesn't extend past al pastor at my usual hole-in-the-wall taquerias, I certainly would've fallen into that trap. So it was easy to say yes to everything. I was in good hands, like masa to be molded. Whatever he told me to eat, I was going to eat! Now that he mentioned it, of course I did. With a few quick words to the owner, our lunch was ordered. 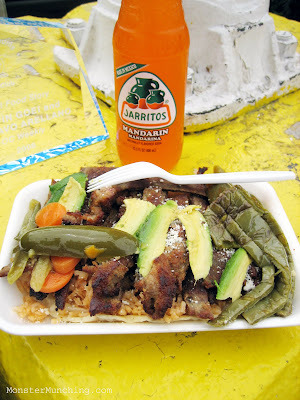 Using a cloth towel, the lonchero started by wiping off the ice from two bottles of mandarin Jarritos. He gave the chilled drinks to Gustavo, who popped the caps off, and handed me one. I took a swig and felt the surge of its nectar -- a throughly refreshing orange soda, made with real sugar and without the sickeningly sweet, lingering aftertaste of high fructose corn syrup that often weighs down its American cousins. Later came the food. And despite the name, the taco acorazados didn't look like a taco at all. At least not initially. It is an "eventual" taco. First, it exists as a pile of food so massive, you hardly notice that beneath it all, there is a hand-formed tortilla the size of a dinner plate. "Acorazado" is the word for "battleship", Gustavo explained. Battleship tacos. Well, now it makes sense, I thought. Though "aircraft carrier" might be more apropos. Also the contents didn't look like your standard taco fillings. It starts with rice, spread out in layer, eclipsing the tortilla below from view. Then on goes acres of milanesa: a beefsteak, breaded with the concentrated flavor of spice, pounded thin, fried to a crispy brown, sliced into strips -- the best country fried steak I've ever eaten. Finally, creamy avocados, pickled jalapenos, carrots, and my favorite of them all: piquant fingers of marinated and briefly grilled cactus. On top, I saw Gustavo squirt orange day-glo hot sauce, a house blend offered in squeeze bottles chilled under an avalanche of finely crushed ice. Afterward he added pickled onions with miniscule bits of finely diced habanero dotting its surface. I followed his example, though I was decidedly more timid in the amounts I applied. As we began to whittle away at our bounty, I relished how well it all worked together. The crisp with the soft. The rice with the protein. The fried with the pickled. 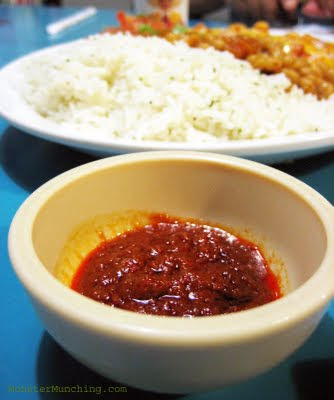 All was lashed together with the unifying force that is the hot sauce. Noticing the streams of sweat now pouring down my face, Gustavo said, "Here, you want this shade?" "Oh no, it's not the sun. It's this!" I pointed at my food. Eventually, I had nibbled off enough toppings to fold up the tortilla as a taco. But in my enthusiasm to blot out the fire, I had consumed most of the meat. All that was left to eat with the dense and coarse tortilla was the rice and pickles. And by then, I was stuffed. We paid a ridiculously low price of $8 for the both of us (though I'm sure it had to do with the fact that the owner knew Gustavo). After the meal, I thanked Gustavo for bringing me here, but also for the ulterior motive for our meetup: he was giving me the OC Press Club Award we won for last year's OC Weekly Food Issue. Since there was only one trophy, he insisted that I take it. But he had one condition: he wanted to take a picture with me. Of course, I obliged. That's the least I could do. Still, I couldn't help but think: How surreal is this?